At the end of 1982, a new faction was introduced to the world of GI Joe. In issue #6 of the Marvel comic, the Joes are sent to Afghanistan to recover a crashed Russian spy plane. Of course, the Soviets weren't about to just sit by and watch that happen, so they sent in their own daring, highly trained special mission force, code-named Oktober Guard. A tough, cigar-chomping veteran with a no-nonsense, no apologies style, Colonel Brekhov is the distinguished commander of the Oktober Guard, a Russian counterpart to the GI Joe team (although he maintains that the GI Joe team is the American counterpart to the Oktober Guard). Colonel Brekhov has spent his entire adult life in military service. He genuinely cares about the welfare of his country and its people, and he feels that the best way he can serve them is to be the best soldier and commander possible. He is a superb strategist and is fearless in battle. 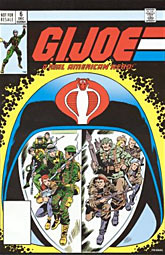 His tactical mind is not above setting aside political differences to occasionally team the Oktober Guard with the GI Joe team to overcome the far greater threat posed by the Cobra organization. Just for the record, the filecard actually says "he maintains that the Oktober Guard is the American counterpart to the Oktober Guard," but it's pretty obvious what they actually meant. Ivan (that's his actual name, not a national slur: Col. Ivan Nikolevich Brekhov) definitely looks like a Russian soldier - or at least, an '80s idea of what a Russian soldier looked like. He's wearing a somewhat ill-fitting tan uniform, making him look slightly disheveled; he's a soldier from the field, not one that's been spending his time parading for the party leaders. His face is less of a caricature than it was in the comics, but it's still appropriately tired and rough. His web gear is green, and his uniform has red accents. 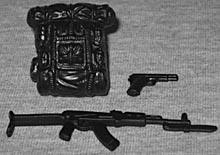 Col. Brekhov is packaged with a black pistol rubberbanded to his hand. Normally that's fine, but the plastic used for his lower arms is so soft that the rubberband actually leaves an imprint on the figure. Well, pretend it's a war wound. Other than that, there's a backpack beneath his feet and an AK-47 next to him in the tray. Okay, that's all easy enough to figure out. Those accessories belong to him. But there's a lingering question we'll get to in just a moment. Daina is an expert marksman in the Oktober Guard and its only female member. Known for her chronically bad temper, Daina is also the most tactically intelligent member next to Colonel Brekhov and often takes the role of second-in-command. Her rough edge is tempered by her coolness in the field, when patience and silence are essential to achieving a hit and completing the mission. As the only woman in the group, Daina feels compelled to do twice as much to prove that she deserves a place in the Oktober Guard, but if you ask any of the other members, they all wouldn't have anyone else beside them in the field�the highest compliment you can receive from one soldier to another. Ah, Daina. Every team needs its token female, even those dirty Ruskies! Okay, technically she's Czech, not Russian, but by that same measure, Col. Brekhov is Ukranian. Anyway, Daina (pronounced like "Dinah") may or may not have had an action figure before. In 1998, there was a figure named Volga: her real name was listed as Daina L. Janack, and she, too, was described as the lone female on the Oktober Guard team. So yeah, pretty safe bet it's the same person. Daina looks like she shares the original Lady Jaye body, but that's not the case: it's actually an original mold. Oh, make no mistake, it's absolutely designed after Lady Jaye, but it's smaller and more detailed. Ditto for the upper legs. The remainder of the parts come from the old figure, except for her new head - you'd probably have noticed the fur hat if anyone had worn it before. The figure is holding an AK-47 in the package, and there's a black knife right over her shoulder. 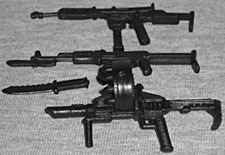 Now, there are two more weapons in the tray: a black machine gun and a black grenade launcher. The gun is positioned between Daina and Brekhov, and the launcher is beneath their feet. So, which accessory belongs to whom? You can really decide for yourself. Split them up however you feel like it. Schrage is a true soldier, a man more comfortable on the battlefield than anywhere else. He's a man of actions rather than words. He's well known for his monosyllabic comments and protracted silences, but even better known for his reliability, determination, and courage. Fancy speeches mean little when you're chin-deep in a firefight and outnumbered by the enemy three to one. That's exactly when Schrage appears at your side to fight beside you until the very last round of ammo is gone. He's got a natural feel for battle tactics and can be relied on to figure a fast, clean way to get the job done. The name "Schrage" (it's spelt without a "c" on the top of the filecard, but with one everywhere else) is of German/Jewish origin, and isn't pronounced the way you think. Every time you've read it in this review, you probably thought it rhymed with "page" or "rage". Nope. It would actually sound more like "saga," or maybe "dodge," depending on the pronunciation. Schrage is wearing the same tan seen on his comrades, and has two black and gold ammo belts around his chest. He looks a bit like Duke, but the small red star on his cap keeps us from forgetting he's in the employ of Kremlin Joe. The figure includes yet another AK-47. Hey, what do you want? It's a Russian gun; of course they all have one. He also gets a second machine gun, of more recent vintage, but that still leaves him on the short end for this set. Schrage has two accessories, Brekhov has three, and Daina has four. Maybe we need to rethink the distribution? Oh well, that's the fun of GI Joe: you decide who carries what. This set includes a reprint of GI Joe #6, the first appearance of the Oktober Guard. It's a good story, and very rooted in its time. Remember, back then we were aiding the Afghani rebels against the evil Russians, so when the Joes are surrounded by the native population, it's a good thing. Their CIA liason even jokes about it. That would be a whole different situation today. It's interesting to see how well the Oktober Guard functions. There are only five of them, yet they still manage to hold their own against the larger, better-supplied Joe team. And perhaps most impressively (for something written in the '80s), they're not completely evil. Yeah, the Oktober Guard is fighting against the Joes, but they're still just soldiers doing their job. They don't want to destroy the West or anything so cartoony, they're just looking to complete an assignment.